As you can see, I served my mussels in cider with linguini. You could too, or just have it on its own with some bread to mop up the sauce. It’s not pretty food, hence the rather messy composure of the photo – sorry – but I assure you it tastes amazing. And I find it’s not worth trying to get the mussels out with a knife and fork – dive in and use your hands. It’s hands-on food. Rar. First, clean your mussels. Wash them and throw away any that don’t close when you tap them sharply. Pull out their “beards”. I always used to assume that this “beard” was trapped seaweed but it turns out it’s actually called the mussel’s byssus, and the mussel manufactures it itself in order to attach itself to rocks. Pretty cool. Chop the onion/shallots and garlic finely. Melt the butter in a saucepan large enough to accomodate all the mussels. Gently fry the onions for a couple of minutes and then add the garlic. Fry for another minute or so, and then pour in the cider. Once the cider is bubbling away, put the mussels in and put the lid on tightly. Give it a good shake every minute or so for 3 or 4 minutes, by which time the mussels will probably all be open and cooked. Drain the mussels, reserving the cooking liquid. Put the cidery cooking liquid back into the pan and turn up the heat. Add the cream and simmer the liquid until it’s reduced and thickened a little. 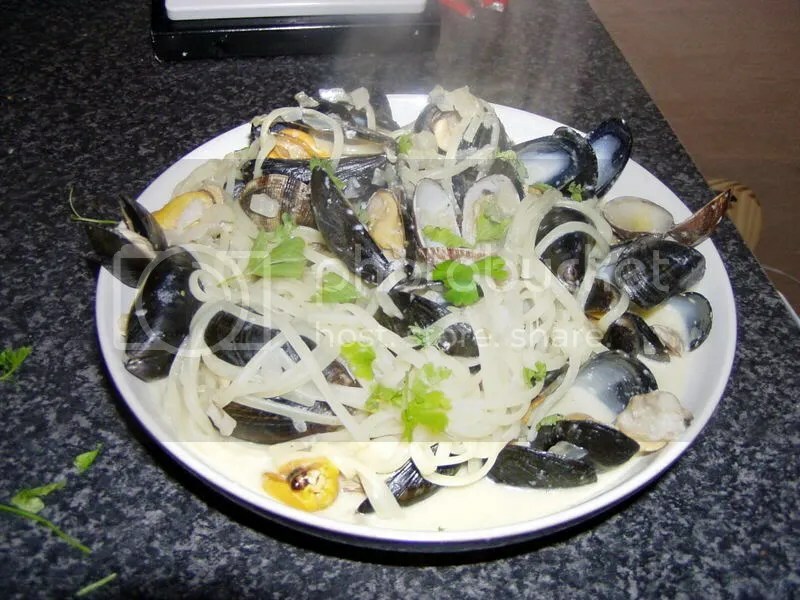 To serve, pour the creamy liquid back over the mussels and mix with cooked pasta if you’re having it with that. Eat eat eat! I see you have a lot of recipes! when you say “Cider” , do you mean the alcaholic drink? All of my questions se-ntedtthalks!